Every time Nick takes control in the kitchen, the resulting dish is a spicy one. He was especially excited about this recipe because it not only satisfies his “spice tooth,” it also caters to my fondness for shrimp. Though neither of us has visited The Big Easy, this dish took us there. 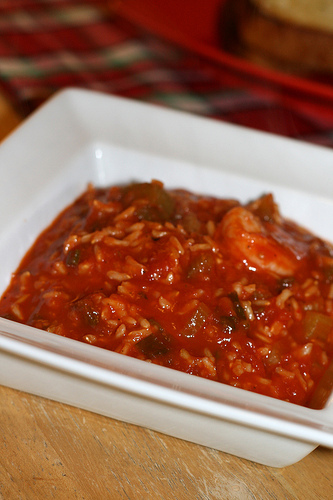 It’s hearty and soulful, and we even added celery to achieve the holy trinity of Cajun cuisine. We also substituted a combination of whole tomatoes and tomato sauce for the suggested tomato juice cocktail, which yields a thicker base — more like a gumbo than a soup. Melt butter in a large stockpot over medium heat. 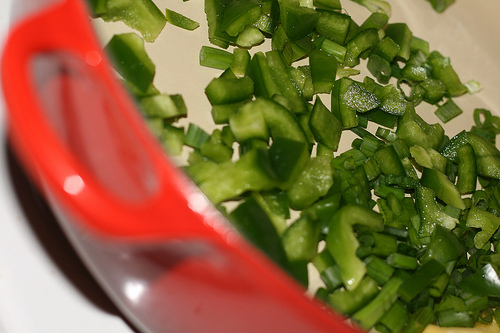 Sauté green pepper, celery, onions, and garlic until tender. Stir in tomatoes, tomato sauce, clam juice, and water. Season with thyme, basil, red pepper, bay leaf, and salt. Stir in shrimp, and cook 5 minutes longer, or until shrimp are opaque. Remove the bay leaf, and season with hot sauce. *Next time we add brown rice to a soup, we’ll cook it separately. It had a bit of a bite, even after an hour. If you choose to use white rice, cook time is about 15 minutes.